WILMINGTON, NC, May 30, 2017 – Wilmington’s first solar carport has been raised by Cape Fear Solar Systems for the New York Forwarding Services Inc site located near the North Carolina State Port. New York Forwarding Services, a global freight forwarder, invested in this 56.6 kW solar generation project to offset the company’s energy demand, lower their utility bills and provide environmental stewardship to the community. Jim Augusta, president of New York Forwarding Services, shares his solar journey, “Solar has been on our minds for many years now. In 2013, an out of state solar company installed a roof-mounted solar system, which proved not to be the right decision, given their limitations to travel to the site and limited experience with coastal conditions.” Jim continues to explain: “A poorly designed solar system ended up damaging our roof, but the savings were too great to give up on the solar panels. 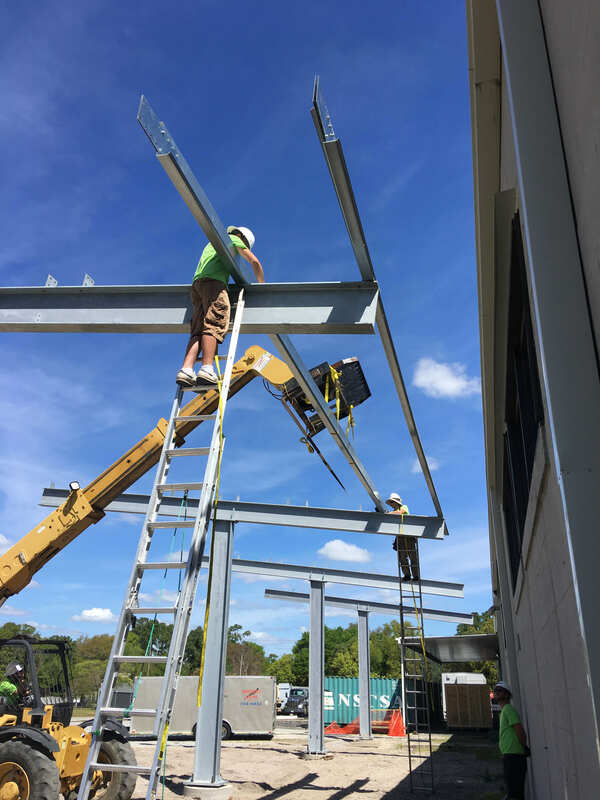 We wanted to have the panels re-installed and we chose the carport structure to keep our big trucks that bring back the cargo parked underneath.,” the investor further states. “The second time, we were clear on our requirements for a local solar installer to have someone in proximity in case of any questions or technical issues down the road.” says Mr. Augusta. Cape Fear Solar Systems is the leading solar company in the region having designed and installed over 400 residential solar systems since its inception in 2007, and built more than a dozen commercial grade solar power generating systems, including carports in other areas of the Port City region. This carport structure is, however, the first of its kind within the Wilmington city limits. The ground-mounted single axis solar carport saves almost $1,000 monthly in electricity expenses. This project clearly demonstrates our commitment to lower our carbon footprint and ongoing initiatives to produce our own energy and rely less on the grid,” highlights Mr. Augusta. Familiarity with the local natural elements is one of the key competitive advantages when hiring a local company versus an out of state organization. “We are now poised to enjoy 25 years of warrantied power production, with a life expectancy exceeding 40+ years,” Mr. Augusta says excitingly. “Now, we look forward to receiving our electricity bills and we will be happy to share our experience with solar power and the company that installed it, Cape Fear Solar Systems, with anybody interested,” Jim mentions. The design of this carport structure was a challenging task, given the strict set of engineering and geo-technical requirements. 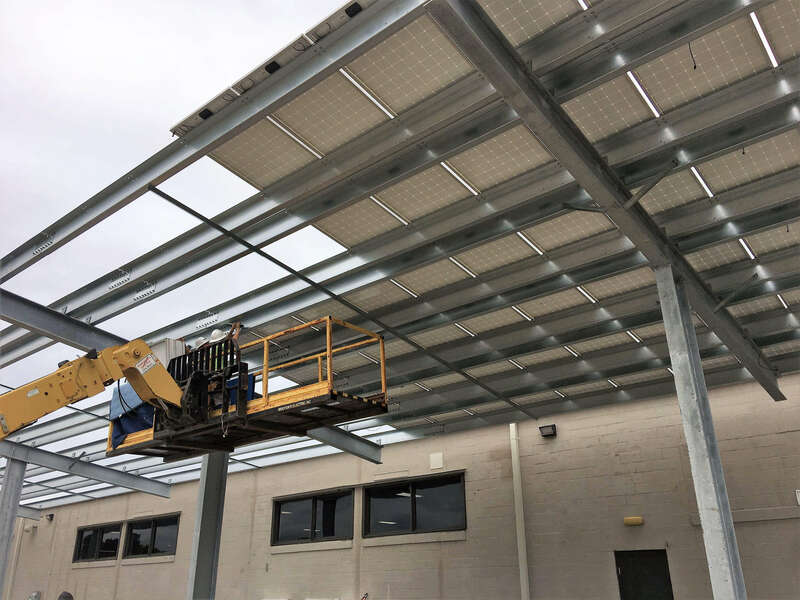 The carport structure consists of 222 solar panels and 5 inverters, it has a 7 degree tilt to optimize it position towards the sun, placed on a 5-pillar steel reinforced system going 10 feet into the ground to meet the rigid wind load requirements with respect to the local soil consistency. 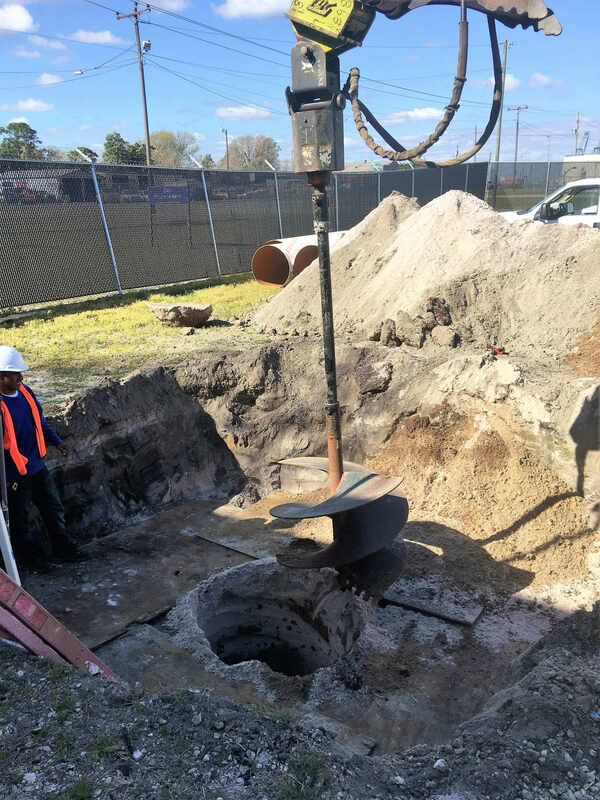 “Being near the river, we had to run tests to avoid shallow water and engineer a foundation capable of meeting the 130 MPH wind load requirements for this zone. I would like to express our thanks to the Planning and Permitting Departments of the City of Wilmington for their support and cooperation as well as to Wooten’s Electric Inc for being a great partner in this project,” Donoghue adds. Headquartered in Berkeley Heights, New Jersey, New York Forwarding Services, a leader in NVOCC (Non-Vessel-Operating Common Carrier) for over 20 years, NYFS is ranked amongst the largest to the Middle East and the Mediterranean operating under the rules and regulations of the Federal Maritime Commission. As a major NVOCC, we have developed and achieved close relationships with the Major Carriers. Our warehouses are completely bonded with 24-hour state of the art Security System. IATA certified, TSA approved. Our ocean and air services offer optimum transit time, several weekly departures to most global ports and airports, our company owned and operated fleet of trucks ensure deliveries to the ports and airports without any delays to your cargo. Our facilities are strategically located at all major hubs in the United States allowing prompt transportation to the entire world. For more information, go to http://www.newyorkforwarding.com/.